Voted Top 5 Honeymoon Cabin! Reach For The Sky is a one bedroom cabin. At 750 sq ft it's just the right size for your honeymoon or anniversary getaway! The cabin has 1 Queen Size Bed (Casper!) and an air mattress so it will accommodate 2 - 4 people. Enjoy the foosball table or sneak to the front porch for a dip in the hot tub with privacy in the woods just minutes from Pigeon Forge. Your nearest neighbors are the two horses that live across the driveway! There is one other cabin on the other side of the driveway but you likely won't notice. On a clear day you can see a slice of the mountains and Mount LeConte! 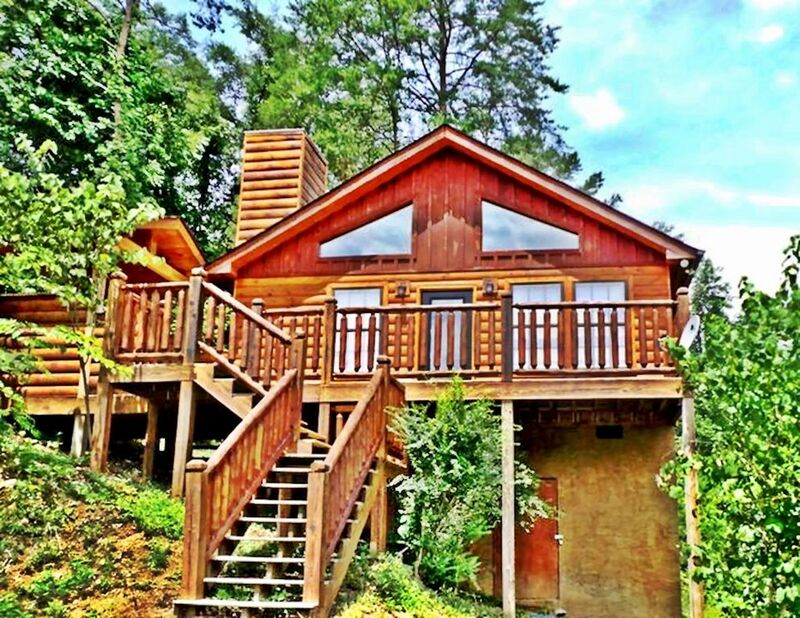 The cabin is located in the woods 15-20 minutes from the main parkway in Pigeon Forge. The Property is Privately Owned and is not managed by a Rental Company, there is a difference! We offer personal service since we own and maintain our cabins. This is not just a dream vacation, it's your new home. It 's easy to see why the Great Smoky Mountain National Park is the #1 most visited National Park in the United States. With over 12 million visitors per year, it is 3 times the 2nd place Grand Canyon. Providing year round attractions, come soak it all in and make your Instagram friends jealous! We strive for nothing less than 5 star service. We are available via the app 24/7 to help you with any needs or concerns before during and after your stay to ensure you have a happy vacation. The cabin is situated off of easy to navigate paved roads and a flat easy gravel driveway. Bring your sweetheart or small family for a tiny glimpse of paradise! This cabin is easily accessible even if it snows! High speed wifi internet is provided as well as cable on 2 large TVs. Absolutely No Pets or animals of any kind! If you sneak in a pet you will be charged $120. We do not offer late check in or early check out. If by chance they are available there is a charge of $50 for each. Luke is a Rock n Roll DJ for SiriusXM radio, originally from Omaha, Nebraska. Avery is a Rockstar Realtor for Keller Williams Originally from Starkville, Mississippi. We met in New York city and moved to Tennessee. It it our priority to provide you with a dream vacation in a clean, quiet, comfortable cabin near the Great Smoky Mountains. We own and operate all of our properties. We enjoy hosting and meeting guests from all over the world. All proceeds go towards improvements and back into the VRBO community with our own travels! It's perfect! Peaceful cabin in the woods. It has one neighbor that you won't know is there. There are horses across the street. On a clear day you can see the mountain in the distance. Luxurious towels and linens and the worlds most comfy bed! toilet, shower, No Shampoo. We do not refresh towels or toilet paper. Small slice of a mountain view from the woods not far from town! Thick, large, luxury bath towels. Please load dishes and run the dishwasher upon departure. Soap provided. We do not provide condiments, zip locks, aluminum foil, etc. Custom kitchen table with custom chairs! Over 200 channels on both TVs! Had a great stay. Loved the seclusion. Loved the wildlife sounds around the cabin, too! Great property. Very convenient to pigeon forge and gatlinburg! Very cozy and comfortable. Would highly recommend to anyone looking for a getaway to the mountains! Will be back for sure. this beautiful cabin was perfect for us , private and secluded. we absolutely loved our stay! and will be back soon! We only stayed 1 night, but it was peaceful and comfy. Beautiful view of the surrounding forest. We thoroughly enjoyed sitting on the deck and listening to nature. There are two flights of stairs to climb to get to the cabin. Just FYI. Great location! Extremely quiet and private. Plenty of room for the two of us. Clean and well kept. We absolutely loved our stay in this adorable cabin. Away from the traffic, quiet and secluded. Not a bad drive from Pigeon Forge area. The owners of the property were more than helpful and quickly answered our one and only question about the cabin. The cabin was very well kept and clean. Everything we needed was there: blow dryer, coffee pot with coffee included, washer/dryer. Nice deck to sit on and an enjoyable hot tub area. We would have given this property a 5 star rating had the view been better. When on the deck, we had a peek at the tops of the Smoky Mountains. But overall, we would recommend this property if peacefulness and rest is what you desire. The “view” is as described in the listing. There is no Mountain View. Unless it’s a very clear day then you can see a baby slice of a view. If you want a Mountain View please book a cabin with a Mountain View. Great place to stay. Highly recommend it to anyone. Would definitely stay again. I made the right choice by booking this place for my vacation. Keep in mind these are winding mountain roads. Many of the best attractions are spread out. The park is gorgeous but timely to navigate for first time flat-landers. There is no Cell Service once you're in the park so be prepared with maps or screen shots. There are no cabins inside the park other than the ones you may pass on certain hikes that are 100 years old and not inhabitable. It's a national park since 1934. PIGEON FORGE: 8 Miles 20-25 Minutes. GATLINBURG: 18 Miles 45 minutes Heavy Traffic. CADES COVE: 30 mountain miles. 1 hour 30 minutes to get there. The loop at Cade's cove is 10.6 miles. Drive it, rent a bike at the start and bike it, or run it. It is closed to cars and open to runners and cyclists Wednesday and Saturday mornings until 10:00am Early May to Late September. Gorgeous views, wildlife, and a pretty good chance you'll see a bear. CLINGMAN'S DOME: 38 mountain miles. This will take 3-4 hours round trip. There are plenty of amazing hikes at Newfound Gap on the way up such as Andrews Bald and "The Jump Off" and more hikes in the Clingman's Dome area. Those less adventurous should at the very least check out the observation tower at Clingman's dome. DOLLYWOOD: 12 Miles Easy Roads. Wears Valley Rd: 6.2 Miles. The Apple Barn: 6 Miles. Tanger Outlet Malls: 6.5 Miles. The Island Amusement Park: 6.9 Miles. Rocky Top Harley Davidson: 7.6 Miles. Wears Cove Gap (our secret park entrance): 13 Miles. Foothills Parkway park entrance: 15 Miles. Neyland Stadium Knoxville 20 Miles 35 Minutes. Gatlinburg park entrance: 18 Miles. New York City: 703 Miles. Rates are subject to change until the reservation is confirmed. Thanks for concidering us!